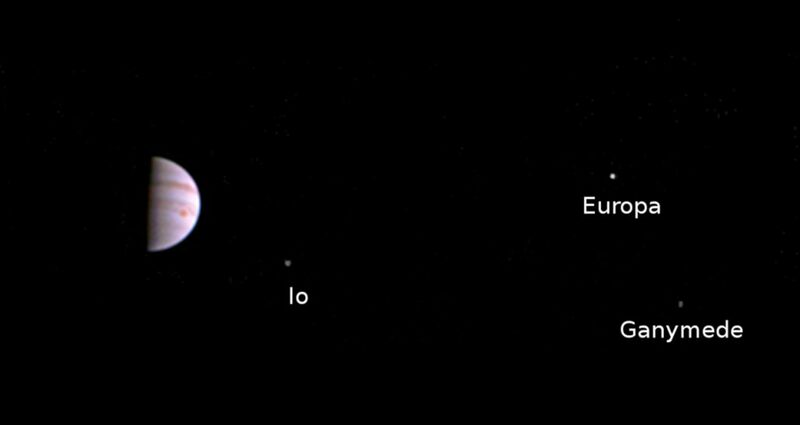 NASA has released the first image from the Juno spacecraft since its arrival at Jupiter last week. This colour view of the gas giant and its moons was taken by the JunoCam imaging camera after the spacecraft entered orbit on 5 July (UTC). It confirms that JunoCam survived its first pass through Jupiter’s extreme radiation environment, and is ready to collect further images. The image was taken on 10 July 2016 at 0530 UTC, when the spacecraft was 4.3 million kilometres (2.7 million miles) from Jupiter on the outbound leg of its initial 53.5-day capture orbit. 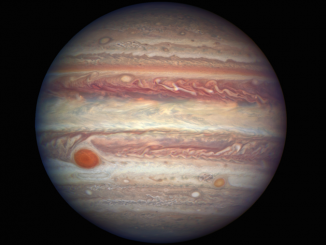 The image shows atmospheric features on Jupiter, including the Great Red Spot, and three of Jupiter’s four largest moons which have been labeled here. JunoCam will continue to image Jupiter during Juno’s capture orbits. The first high-resolution images of the planet will be taken on 27 August when the Juno spacecraft makes its next close pass to Jupiter. 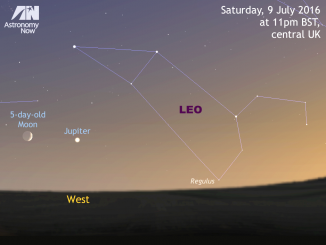 Find out more about the Juno mission in the July issue of Astronomy Now. Get your copy in the shops or order online. Or subscribe today and never miss an issue. On April 3, 2017, as Jupiter made its nearest approach to Earth in a year, NASA’s Hubble Space Telescope viewed the solar system’s largest planet in all of its up-close glory. 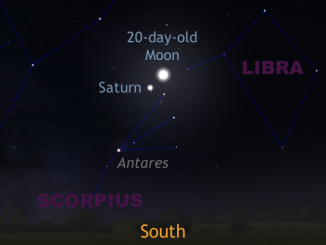 The 20-day-old waning gibbous Moon has a close encounter with ringed planet Saturn in northern Scorpius in the pre-dawn hours of Thursday, March 12th.